If you’ve been following these little articles you’ll already have read about how to set up eclipse to use external configuration directories for individual context / plugins and their associated features. 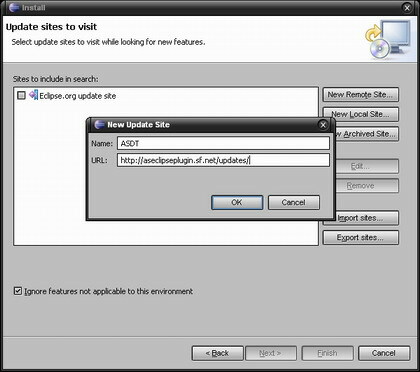 I mentioned briefly about setting the .eclipseextension file to the correct version of your eclipse install otherwise you run the risk of issues when using update sites as the initial installation source. 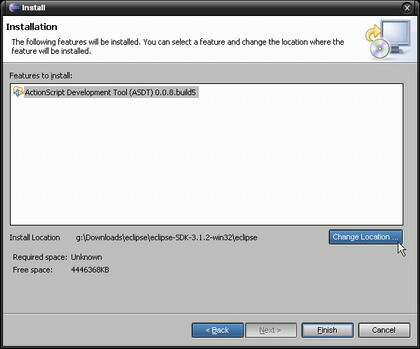 To this end I thought I’d post up some details of how to actually add a context to eclipse via an update site; as well as installing it directly into an external configuration directory at the same time. The steps are fairly painless to achieve this and I’ve added in a few images to provide pointers in case there is any confusion, I’ve also covered off the two commonest ways to install plugins via this method – those being having already added your external configuarion to eclipse via the Manage Configuration menu, (see the previous article). Or by actually adding the external location once we have selected our remote site to install from. I’m going to use the Actionscript Development Tool (ASDT) as the example context that I wish to install, and I’m going to install it into an external directory structure – If you’re not sure how to create an external configuration you can read about the process here. First of all create the external directory structure for your context – in my case the root folder is called ASDT. 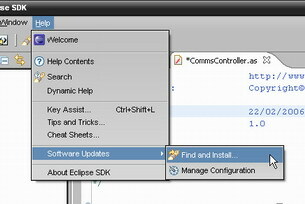 Next fire up eclipse if it isn’t already running and click on Help > Software Updates > Find and Install. 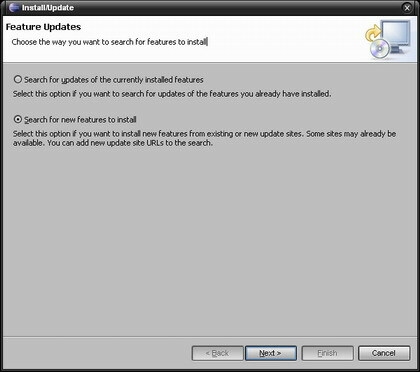 Next we are presented with a dialog where we can chose to either Install or Update, select the option to “Search for new features to install”. This will open another dialog which will allow us to add our site details for the location we wish to install from. This can be a remote site (the commonest option) or a local site (if you installed the Flex Builder 2 alpha plugin for eclipse you’ll know all about this option). The local option is for the installation of plugins for, as you may have guessed, a locally held version. To add our site location click either the New Remote Site or New Local Site. In our case we want to add a new remote site so select that option. As you can see the dialog that opens once you click on a new location requires a ‘friendly name’ and an actual location. For this example I’m going to coninue on my acronym theme and put ‘ASDT’ in the name field and the URL for the update repository for ASDT in the URL field, in case you don’t already know the ASDT URL is ‘http://aseclipseplugin.sf.net/updates/’. Click OK once you’ve entered these details to add the new entry. You’ll now see that the initial dialog that opened has a new entry, which should be selected by default, called ASDT. The ‘Finish’ button is now active so click this to progress to the next step. At this point eclipse will attempt to connect to the URL making sure it is valid, i.e. it exists at the very least :P. If all goes to plan you’ll be presented with yet another dialog listing the available options for you to chose from for that particular context. The image below shows the expanded ASDT repository and I have selected the most recent version available, (which at this time is an unstable build 0.0.8.build5). If there were more options they would be listed below the root ASDT folder on expansion. Next to this is a button called ‘Change Location’, this is where we set our external path for installing our selection into our external configuration. Now this is where we have a split in configuration. If on the one hand you have already added your external configuration path to eclipse via my previous article upon clicking the ‘Change Location’ button you will have the option of selecting the external directory you wish to use. 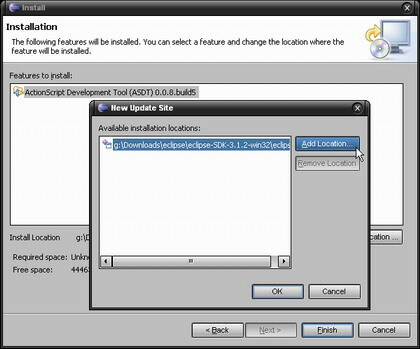 However if you haven’t added your external directory yet once the pop up opens you can use the ‘Add Location’ button to browse to the folder and add it in there and then – Remember you need to navigate down into your external configuration directoy to the ‘eclipse’ folder within it. Once you have added / selected your location click OK to close and apply this setting. Now all that is left to do it click Finish on the visible ‘Installation’ dialog and the installation will start. Once the files have been downloaded you’ll be asked to restart your eclipse IDE to load up the new files – you do get the option to just apply it, however I would recommend restarting if this is the initial install just to make sure it loads correctly first time round. The Balthaser patent rumbles on…. I have five plugins and out of these two plugins are win32 platform specific and one plugin is intro plugin which depends on rest 4 plugins on win32 and on two platform independent plugins on unix platforms. For this I have created two plugin.xml of intro plugin i.e. plugin.xml for win32 and plugin_unix.xml for unix and have done changes in build so that plugin_unix.xml will be bundled as plugin.xml for unix installers and win32 specific plugins get bundled in win32 installers only. 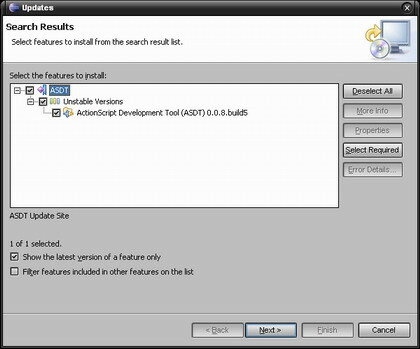 For above scenario I want to support auto-upgrade feature of eclipse using update site. I have decided to create three feature viz., com.core.feature, com.unix.feature and com.win32.feature. where unix and win32 feature will depend on core feature, core feature will include platform independent plugins, unix feature will include intro plugin where plugin_unix.xml is renamed to plugin.xml and win32 feature will include win32 specific plugins and intro plugin. In unix installer core and unix feature will get bundle and in win32 installers core and win32 feature will get bundle. Now I want to create a update site project using which I can refer different intro plugins in unix and win32 feature i.e. location of two intro plugin will be different and it should be refer by unix and win32 feature correctly so that unix specific plugin should not get updated in win32 and vice versa. Here main concern is that both intro plugin will have same name hence cannot be place them in update_site_project/plugins folder hence location should be different and if locations are different then unix and win32 feature should refer correct plugin while update. Hopefully, problem must have clear. Waiting for positive reply. Please send the reply to Jayesh_ecs@yahoo.co.in email address. suppose we are trying to download one component from update site. But It is having two versions. Here the problem is update site should allow one version. But it allows both versions to Install. so what needs to be do to enable that feature?